Transcranial magnetic stimulation has been gaining popularity in the therapy for several neurological disorders. A time-varying magnetic field is used to generate electric field in the brain. As the development of TMS methods takes place, emphasis on the coil design increases in order to improve focal stimulation. Ideally reduction of stimulation of neighboring regions of the target area is desired. This study, focused on the improvement of the focality of the Quadruple Butterfly Coil (QBC) with supplemental use of different passive shields. Parameters such as shape, position and permeability of the shields have been explored to improve the focus of stimulation. Results have been obtained with the help of computer modelling of a MRI derived heterogeneous head model over the vertex position and the dorsolateral prefrontal cortex position using a finite element tool. Variables such as maximum electric field induced on the grey matter and scalp, volume and area of stimulation above half of the maximum value of electric field on the grey matter, and ratio of the maximum electric field in the brain versus the scalp have been investigated. This article is published as Rastogi, Priyam, Bowen Zhang, Yalun Tang, Erik G. Lee, Ravi L. Hadimani, and David C. Jiles. 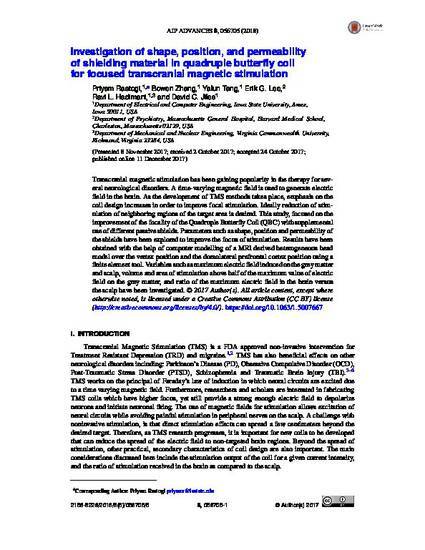 "Investigation of shape, position, and permeability of shielding material in quadruple butterfly coil for focused transcranial magnetic stimulation." AIP Advances 8, no. 5 (2018): 056705. DOI: 10.1063/1.5007667. Posted with permission.